[136 Pages Report] The ultra-wideband (UWB) market is expected to be worth USD 85.4 Million by 2022, at a CAGR of 5.2% between 2016 and 2022. The base year considered for the market estimation of the study is 2016 and the forecast period is between 2016 and 2022. 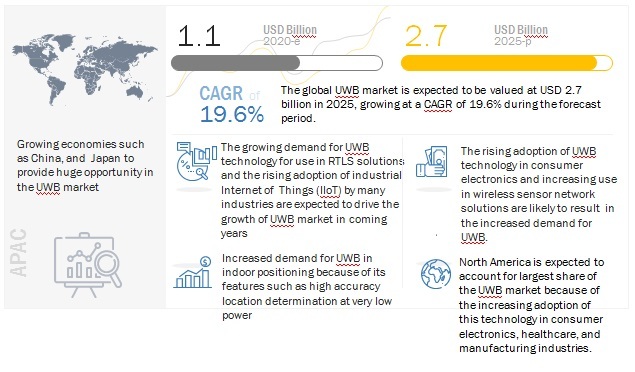 Micromarkets1 are defined as the further segments and subsegments of the overall UWB technology market included in the report. Core competencies2 are provided in terms of the key developments, SWOT analysis, and key strategies adopted by companies to sustain their position in the market. This report provides valuable insights into the ecosystem of the UWB market. The major players in UWB market include DecaWave Ltd. (Ireland), 5D Robotics, Inc. (U.S.), Pulse~LINK, Inc. (U.S.), Alereon, Inc. (U.S.), BeSpoon SAS (France), Fractus Antennas S.L. (Spain), Johanson Technology, Inc. (U.S.), and Nanotron Technologies GmbH (Germany). 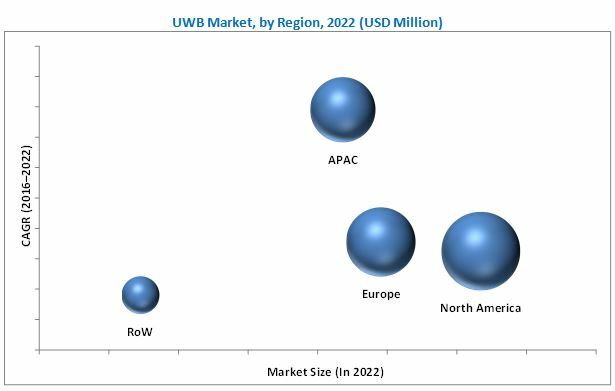 The ultra-wideband (UWB) market was valued at USD 62.9 Million in 2016 and is expected to reach USD 85.4 Million by 2022, at a CAGR of 5.2% between 2016 and 2022. The growing adoption of UWB-based real-time location system (RTLS) solution for resource utilization and workflow optimization in manufacturing industries, increasing technological advancements in terms of precision and range, and rising market competitiveness are the major drivers for the UWB market. UWB technology is expected to witness a significant penetration in indoor positioning system applications in smart homes and retail stores between 2016 and 2022, to become a mainstream technology for tracking and location-based services. With an increase in awareness regarding the advantages of automatic asset tracking and management, the market for UWB-based RTLS/wireless sensor network (WSN) technology is projected to grow at an above average rate between 2016 and 2022. The scope of this report covers the ultra-wideband (UWB) market on the basis of end user, application, and geography. The healthcare vertical led the UWB market in 2015, and the trend is expected to continue till 2022. The high acceptance rate of UWB technology in healthcare to track and monitor assets, personnel, and patients as well as to maintain a hygienic environment is dominant factor behind the largest market share of the healthcare end user segment. Residential and manufacturing segment are expected to grow at the highest rate in the UWB market between 2016 and 2022 because of the broad application and use cases of UWB technology in these industries. The RTLS/WSN application segment of the Ultra-Wideband market is expected to grow at the highest rate between 2016 and 2022. The high precision location identification, low interference with other signals, usability in both outdoor and indoor environments, and acceptable operating range makes UWB a significant technology in the RTLS/WSN applications. North America held the largest share of the Ultra-Wideband market in 2015 owing to the extensive presence of major UWB players in this region. Moreover, the presence and early adoption of UWB technology in various industries such as healthcare, retail, and manufacturing in North America has contributed to the market dominance of this region. The U.S. is a major contributor to the growth of the UWB market in North America. The Ultra-Wideband market in Asia-Pacific (APAC) is expected to grow at the highest rate among all other regional markets for UWB between 2016 and 2022. During the early commercialization period of UWB technology, several start-ups with UWB product portfolio for communication and consumer electronics have emerged. However, the UWB technology did not succeed as anticipated, in terms of overall revenue and regulatory standards. After almost 11 years of its commercialization period, the overall market size of the UWB technology remained less than USD 60 million as of 2015. The lack of universal regulatory framework along with the high cost of UWB technology has led to its low adoption in the consumer electronics segment. Moreover, the performance of UWB in terms of data rate is slow particularly in the consumer electronics segment. Furthermore, the superior cost versus the performance trade-off of counterpart wireless technologies such as ZigBee and Bluetooth have led to the lower adoption of UWB technology in the consumer electronics segment. Some of the major companies operating in the UWB market are DecaWave Ltd. (Ireland), 5D Robotics, Inc. (U.S.), Pulse~Link, Inc. (U.S.), Alereon, Inc., BeSpoon SAS (France), Fractus Antennas S.L. (Spain), Johanson Technology, Inc. (U.S.), and Nanotron Technologies GmbH (Germany). 10.3 Taiyo Yuden Co., Ltd.